Christianity: A Biblical, Historical, and Theological Guide for Students is a mutual effort by Kathy Lopez, Don Penny, Glenn Jonas, and Adam English, the faculty of the Religion department at Campbell University. 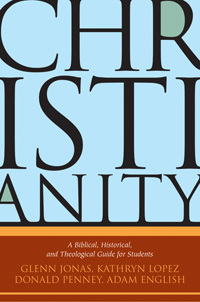 This book is specifically designed to be used as a textbook for a course called “Introduction to Christianity.” The text is the product of more than a decade of classroom work and will provide students with a general introduction to the Christian religion, giving particular emphasis to the biblical, historical, and theological traditions within Christianity. In addition to its primary purpose as a textbook, this book will prove useful to anyone who may be interested in Christianity, from non-Christian inquirers to lay persons in weekly Sunday-school classes. The book is divided into four major units. The first section explores the Old Testament. The second section provides an overview of the New Testament. The third section delves into Christian history beginning with the early centuries and moving through the Middle Ages, Reformation, and into the modern era. The final section asks questions such as “What do Christians believe?” and “What do Christians do?” Accessibly written, this text is now available as a new edition of the best-selling A Journey of Faith: An Introduction to Christianity with more than 50 percent new material.